It's easy to use and will help you save time and energy so you can focus uniquely on improving your game. Easy to pack and carry, it fits right into your golf bag. With long reach of this golf ball retriever, it's a valuable aid for any golfer to retrieve those hard to get balls. 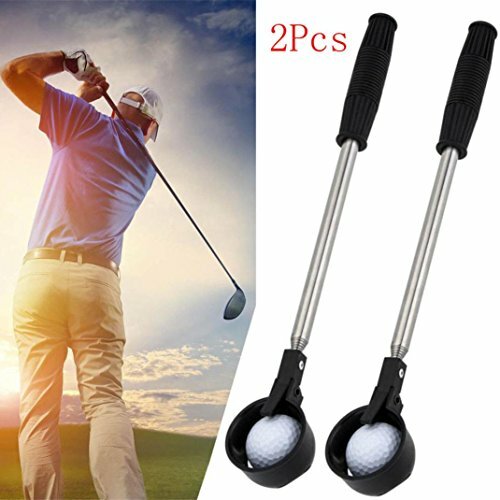 With the help of Telescopic Golf Ball Retriever, you can quickly and simply scoop up your ball without any accidents. Scoop Diameter: Approx. 1.8 inch. Scoop Depth: Approx. 1.7 inch. Fully Retracted length 42cm /16.5", Fully Extended length 2m / 78.5". Color: Black handle and scoop, Silver stainless steel shaft. Package Contents: 2X Golf Ball Pick Up Retriever. Fully Retracted length 42cm /16.5", Fully Extended length 2m / 78.5". Material: Stainless steel + ABS. Color: Black handle and scoop, Silver stainless steel shaft. Package Contents: 2X Golf Ball Pick Up Retriever. Scoop Diameter: Approx. 1.8 inch. Scoop Depth: Approx. 1.7 inch. With long reach of this golf ball retriever, it's a valuable aid for any golfer to retrieve those hard to get balls. With the help of Telescopic Golf Ball Retriever, you can quickly and simply scoop up your ball without any accidents. If you have any questions about this product by Shuwe, contact us by completing and submitting the form below. If you are looking for a specif part number, please include it with your message.